Pain originating in the face may be caused by an injury, an infection in a structure of the face, or a nerve disorder. Also, facial pain may begin from the jaw joint (TMJ) and the referred pain may spread to any other part of the face. Facial pain sometimes occurs for no known reason or more commonly due to stress in life. Trigeminal neuralgia (TN) is a condition that is characterized by intermittent, shooting or stabbing pain affecting only one side of the face. The disorder also is called tic douloureux. 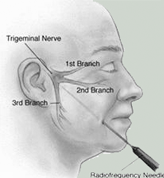 Trigeminal neuralgia affects the trigeminal nerve, one of the largest nerves in the head. The trigeminal nerve sends impulses of touch, pain, pressure, and temperature to the brain from the face, jaw, gums, forehead, and around the eyes. The most frequent cause of trigeminal neuralgia is a blood vessel pressing on the nerve near the brain stem. The constant rubbing with each heartbeat wears away the insulating membrane of the nerve, resulting in nerve irritation and short circuit of the nerve impulse. This leads to severe shooting pain like an electric shock which lasts for a few seconds on that part of the face supplied by that nerve. Trigeminal neuralgia can be first treated with certain drugs such as Carbamazepine or Frisium or Gabapantine. If the medical line of management does not control the pain, then surgical procedures may have to be carried out. The most simplest would be freezing of the nerve or sectioning of the nerve terminal by a Faciomaxillary Surgeon. However in severe conditions, an intracranial procedure by a Neurosurgeon may have to be carried out to decompress the vessel and the nerve root.